On their first visit to Mweso, passengers in the MSF car are often amazed by the view of the flourishing vegetation and the innocent, tree-lined hills along the road that leads to Mweso, where MSF has been working since 2009. Mweso is located 16 km north of the town of Kitchanga, in eastern Democratic Republic of Congo (DRC). Each time I pass through Kitchanga, past events buried in my subconscious awaken. I worked with MSF in Kitchanga from 2002 to 2005 managing the security guards, and again from 2008 until 2013. That year, the MSF project in Kitchanga was closed after a terrible conflict that devastated practically the whole town: the MSF base was burned down, as were many houses, including my own. "I was losing weight day by day, and dark thoughts invaded my mind constantly." Eight of us had stayed in the village during these sad events; we had given up hope of making it through the night. What a relief it was to see the sun rise over the horizon the next morning and our MSF colleagues coming to rescue us, along with a number of people who had been wounded in the fighting. Our respite, however, did not last long: the crackling of gunfire resumed immediately and our car was fired on. We only just managed to escape into the safe room of the health post where the MSF team was working. Bulamba during at work in Mweso school, where more than 145 families have lived since April 2017. 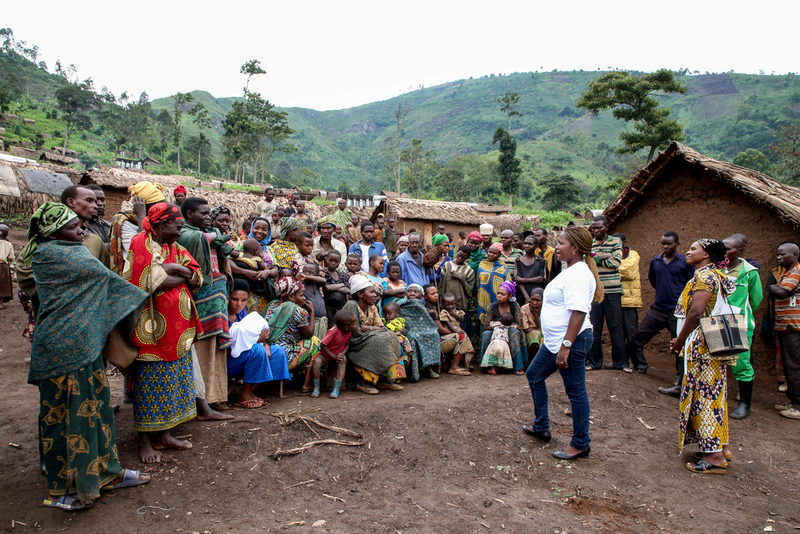 After the clashes, I moved my family to Goma, the capital of North Kivu province. I was losing weight day by day, and dark thoughts invaded my mind constantly. MSF sent a mental health advisor, Eleanor, to support me through this. Before she arrived, every time I slept, I heard the crackling of bullets and the sound of bombs exploding around me. I would wake up suddenly, leap out of bed and try to get my breath back. I was afraid I was quickly heading for mental illness. Eleanor’s advice was very helpful to me. Shortly afterwards, the Kitchanga project was closed, but I stayed on and continued health promotion activities at Tumaini ['Hope' in Swahili] clinic, which had remained open to care for victims of sexual violence and infections. Later, after Tumaini clinic closed, I came to Mweso. Here, I was assigned to the general hospital which is supported by MSF. My main activity was to listen to the difficulties encountered by patients in their home towns and villages. Nine years have passed since then and I currently supervise the health promotion programme. Today, Mweso is again at the centre of the troubles, with activities by armed groups and counter-operations by the military. As a result, this place is a permanent reception area for displaced people from the surrounding area – because of its central position, its cosmopolitan character, the presence of non-governmental organisations and the free healthcare provided by MSF.